Olentangy Liberty players celebrate after outlasting rival Olentangy Orange in five sets Tuesday in Powell. With the win, the Patriots are tied with the Pioneers atop the league standings. 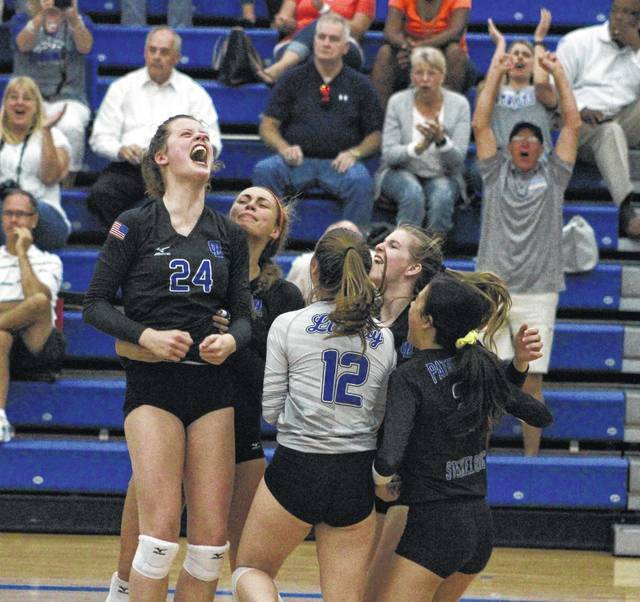 The Olentangy Liberty girls volleyball team used a 14-2 run in the fourth set to get momentum and followed with a 5-1 start in the fifth to keep it in a marathon win over rival Olentangy Orange Tuesday night in Powell. The Patriots won 18-25, 25-21, 20-25, 25-16, 15-11 to move into a first-place tie with Orange for the OCC-Buckeye title. Liberty, which hasn’t lost since the Pioneers won in straight sets earlier this month in Lewis Center, got strong play on the block in the final two frames. Fogg had six blocks for the game and Abby Erickson finished with three to lead the Patriots (15-1, 5-1). The game featured two Division-I college commits, who are both setters. Orange’s Carrigan O’Reilly, a junior who is committed to Xavier University, finished with 49 assists and Fogg of Liberty, who is committed to play at the University of Toledo next fall, finished with 40 assists. Heather Littlejohn and Grace Clark finished with 11 kills apiece, Claranne Fechter had 23 digs and Maile Steckelberg had 19 service points, including an ace to lead the Patriots. Orange coach Katie Duy admitted it was a difficult loss because of what it means in the title race, but vowed her team would learn from it and turn it into a positive. London Davis led with 14 kills, Taylor Metzler had 10, Megan McCollum had 28 digs, Sidney Gossard had five blocks and Addie Evans and Sophie Dahn had two aces apiece to lead the Pioneers (13-3, 5-1). Duy highlighted the play of Madison Moll, who finished with 12 kills. Both teams continue league play Thursday. Liberty visits Westerville South and Orange hosts Westerville Central.